The tobacco epidemic has evolved considerably since the first Surgeon General’s Report on Smoking and Health released back in 1964. As depicted by California Tobacco Facts and Figures 2018, the tobacco use problem has morphed from being all about cigarettes to a diverse group of tobacco product categories that includes cigarettes; chew and snus tobacco; cigarillos and little cigars; hookah; and a variety of electronic smoking devices. The latter category includes cig-a-likes, refillable tanks, and an explosion of devices that look like USB flash drives, lip-gloss, or pens. Coinciding with the diversification in electronic smoking devices is an exponential growth in flavored tobacco products; the number of flavors these products come in more than doubled from 2014 to over 15,500 flavors today. Flavored tobacco products are driving youth experimentation; more than 80 percent of youth who ever used a tobacco product reported that their first product was flavored. Dramatic shifts in tobacco marketing have also occurred. Beginning in the 1970s, federal legislation, lawsuits, and regulations severely restricted the ability of tobacco companies to use television, radio, billboards, print, sponsorship, and cartoon characters to sell their products. As these restrictions mounted, tobacco companies moved their marketing attention to the unregulated retail environment.10 Direct mail coupons, in-store price promotions, retailer incentives, and other in-store advertising dominated tobacco company marketing expenditures. By 2011, nearly 90 percent of tobacco industry marketing expenditures were directed towards retail price promotion and price discounting strategies. The latest tobacco marketing leverages social media and exploits social influencers, including teens, to peddle tobacco products through YouTube product reviews, Instagram, and tweets. This shift from static marketing channels to dynamic social platforms is ubiquitous, and exists in a shadowy online environment, which makes tracking and analyzing tobacco marketing more complex and reliant on big data systems to capture and analyze tobacco marketing and promotions. The giant foothold (54.6 percent of market share) that JUULs gained in a two-year period, within the electronic smoking device product category, illustrates the power of digital and social media to influence tobacco product use without relying on traditional media channels. So why does the proliferation of tobacco product categories and shifts in tobacco marketing matter? California Tobacco Facts and Figures 2018 presents a troubling picture of teen tobacco use. The data show that while teen cigarette smoking in 2016 is low (4.3 percent), overall tobacco use among teens is stagnant. In 2016, overall teen tobacco use rate (13.6 percent) is comparable to cigarette smoking rate in 2010 (13.8 percent). The proliferation of tobacco product categories, flavored products, and the evolution in tobacco marketing appear to be fueling teens switching from traditional cigarettes to a new generation of tobacco products. A rapid public health response to the evolving tobacco product marketplace is needed to prevent the next generation of youth from a lifelong addiction to nicotine. 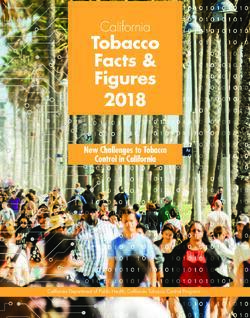 California Tobacco Facts and Figures 2018 also documents that while adult cigarette smoking in California is on a downward spiral, highly vulnerable population groups including those with psychological distress, persons with disabilities, low income, and low educational attainment continue to have very high rate of cigarette use. Additionally, African Americans, American Indians, certain ethnic-specific Asian (e.g. Korean, Vietnamese) males, gender and sexually diverse groups, and rural populations have very high rate of smoking. Conversely, White and Hispanic/Latino groups have a lower smoking rate than some groups, but they comprise a very large portion of California’s overall smoking population which makes addressing tobacco use in these groups important too (see Figure 4, Adult cigarette smoking rate and number of smokers in California by demographics, 2015-16). The size and diversity of California’s smoking population indicates that helping current tobacco users beat their addiction to nicotine is going to require an intensive effort. Simply applying those strategies that got us this far, is not sufficient to get us over the goal line. It is going to take more intensive support to help these vulnerable populations quit for good. One important place to focus our efforts is to ensure that health and behavioral health care systems identify and treat nicotine addiction as a standard of care for all patients - without regard to the initial encounter. It’s time to “wake-up,” this is not our father’s cigarette-pack-a-day problem. Ending tobacco use in California is going to require a lot of work, across all sectors. The California Tobacco Control Program hopes that the data in this report will be used to focus resources and build the momentum needed to get the job done. 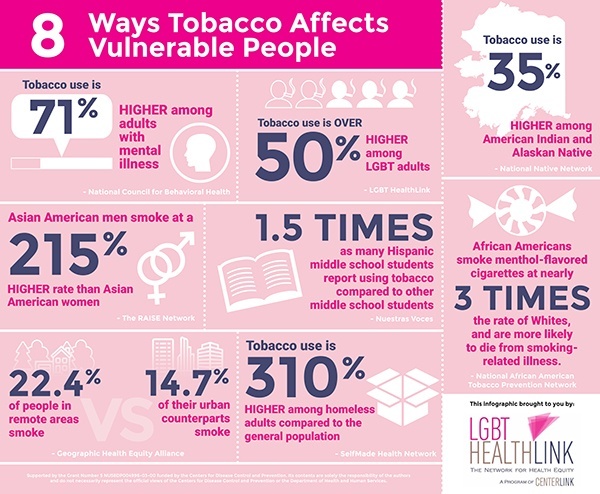 LGBT HealthLink worked in collaboration with Sibling National Disparity Networks to create a tool that would provide a fast way to convey how tobacco, the cause of one third of all cancers, has a disproportionate impact on disparity populations. The resulting infographic will aid health officials, health providers, as well as decision makers to highlight pertinent information on the key tobacco related disparities, broaden understanding, and promote ideas for action. Please right click on either image below to download and use on your website or in other digital publications. "We hope that this tool will empower our stakeholders to draw attention to key tobacco disparities about each of these priority populations around the nation" stated, Regina R. Washington, LGBT HealthLink Director. Our Collaborators: National African American Tobacco Prevention Network, National Native Network, The RAISE Network, Nuestras Voces, National Behavioral Health Network for Tobacco and Cancer, Geographic Health Equity Alliance, and SelfMade Health Network. Please feel free to contact LGBT HealthLink for more information, and to share this infographic widely to motivate your grantees to build disparity population engagement in their daily activities. The California Smokers' Helpline offers free, evidence-based tobacco cessation services in multiple languages to help smokers quit. We also offer free training and resources to health professionals to increase their knowledge and capacity for tobacco cessation. For more information about our free training and resources for health professionals, please contact the Helpline Communications Department at (858) 300-1010 or cshoutreach@ucsd.edu. TABLE OF CONTENTS LEGAL NOTICE OF PRIVACY PRACTICES Copyright © 2004-2017. The Regents of the University of California. All Rights Reserved.